Plot Summary: Sumimura Yoshimori, a 14-year-old junior high school boy, is a descendant of Kekkaishi, or an exterminator of monsters He is vying for the heir to the family with Yumikura Tokine. 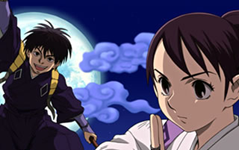 Tokine is older than him, and she is his childhood friend as well as his rival Kekkaishi. To save people from the crises, and to make himself stronger, Yoshimori fights against monsters tonight, too. Kind of a disappointment, in my not so humble opinion. I was hoping for something like Darker Than Black, but we still have one more anime to be announced that apparently AS has acquired and will be airing. Discuss the news story here over at the forums.